OnePlus has giving new things about the OnePlus 2 one day at a time now. Right now we have know that it will have the Snapdragon 810v2.1 processor and most recently OnePlus give us the price that will be less than $450. 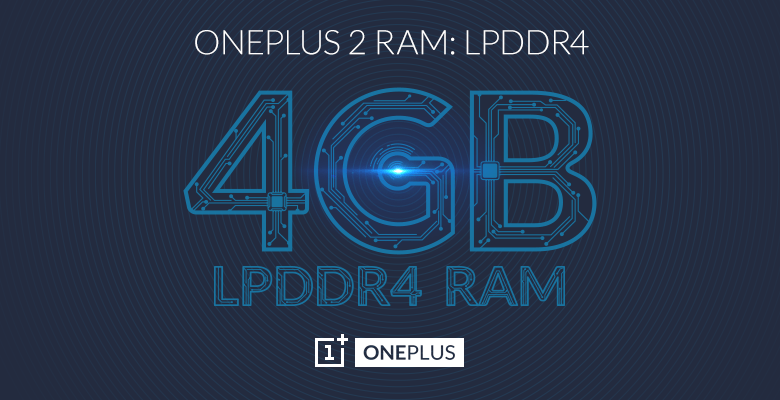 Now, thanks to their latest reveal, it will pack 4 GB of LPDDR4 RAM. That means not only the processor will be power packed also RAM will one off the firsts till now for that means it can handle whatever gets thrown at it, it will be more efficient as well. OnePlus 2 has a lower operating voltage than its predecessor. It will run at 1.1v instead of 1.2v which should lead to increased battery life and less heat overall also LPDDR4 RAM is twice as fast as LPDDR3 RAM. We’ll have to wait until the July 27th unveiling in virtual reality to know more about the device.